You have been dedicated to CBRNe Defense since 2002; what are the biggest changes in doctrine and resources that you have observed and what trends do you see ahead of us? 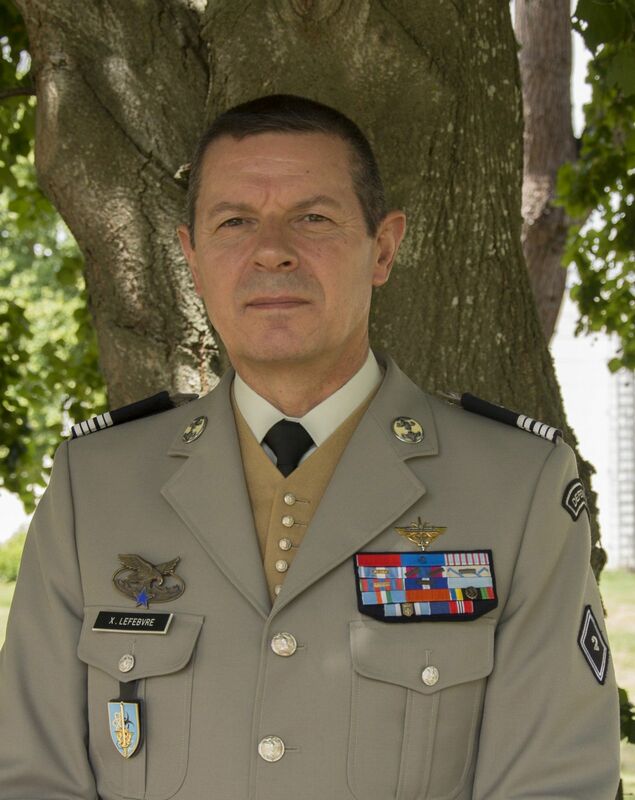 Actually, I joined CBRN Defense – NBC Defense at that time – in June 2001 as I was engaged in the General Staff Course at the then Joint Staff College in Paris. It was still the Peace Dividends’ era which had resulted in France in a dramatic downsizing of our CBRN defense capabilities. For instance, the Army was only maintaining a 2 companies strength specialized battalion while basic training was no longer a priority among the Armed forces. 9/11 was a shock! We realized that we were engaged in a dangerous path, lower than the minimum required. Decisions were taken to rebuild and centralize our land capabilities around a unique regimental-sized pool of experts able to support deployed forces but also subsequently contribute to the domestic security from joint coordination. A major and continuous trend has been the enlargement of the CBRN defense scope - which could be somehow synthesized in “from NBC to CBRN”. Up to the 90’s, the main mission of NBC Defense was to support the armed force in a major high-intensity conflict, facing large scale NBC threat. Then from the Balkans emerged industrial and environmental risks to be dealt with – so-called ROTA - which came along with WMD proliferation and pandemic concerns as potential consequences from the increasing globalization and border opening. Consequently, while NBC defense had been focusing fo decades on war agents, CBRN defense is now trying to deal with all issues from the basic environmental risk encountered by our deployed force to a nuclear burst part of a major conflict. For instance, in 2014-2015 France deployed a Medical Personnel Treatment Center in Guinea as part of their effort to fight against the Ebola epidemic. This trend has been recently amplified by the emergence of non-state actors and the actual end of a non-use taboo from state actors such as Syria but also through targeted assassination attempts. To face those evolutions we have now been shifting to a more active attitude, from the fight against WMD proliferation to counter-proliferation including actual strikes against the Syrian remaining chemical program capabilities. Eventually, while those trends should extend to the upcoming decade at least, the rapid technological developments in all areas - such as nano and biotechnologies, genetics or 3D printing - and their easier accessibility though digital proliferation is a matter of vigilance - if not of concern - for the near future. CBRN defense must track all evolutions that may impact its ability to protect forces and the population, while at the same time high-intensity threats has not fully disappeared. In your opinion, what are the best qualities of the Joint CBRN Defence Center at your command, and in general, of France's approach to CBRNe Defence? France has adopted an original approach with regards to her CBRN Defence organization. There is no CBRN Defence command in place but rather integrated governance from the upper political level, close to the Prime Minister’s Secretary General for Defence and Security, down to the strategic and military level through comprehensive steering and executive committees’ structure. This ensures that coherent guidance is staffed, issued and properly implemented - and controlled - at all levels, with the actual commitment of all relevant actors. The Joint CBRN Defence Center is the core implementation body of this governance. Its mission is to guarantee to the Armed force the control of their CBRN capabilities so that they are able to fulfill their operational contract under CBRN conditions. This includes the provision of expertise at the joint level, concretely doctrine and capability development, human resource organization and operational expertise, an education branch implementing a catalog of more than 40 CBRN courses, the piloting of specialized capabilities’ operational preparedness and the conduct of interdepartmental and international cooperation. Based on your experience within NATO, including with the NATO Combined Joint CBRN Defence Task Force and Centre of Excellence: what more can be done to foster quantity and quality when cooperating internationally? A lot has been done from the Prague Summit CBRN initiative in 2002 to now. NATO now retains a unique operational CBRN capability – namely the Combined Joint CBRN Defence Task Force – which has been rotating and integrating Nations from 2004, thus ensuring that Nations are fully trained and interoperable in the highest standards of CBRN Defence. A NATO CBRN Reachback capability is operating from its Joint CBRN Defence Center of Excellence, putting together the expertise of its sponsoring nations through a unique and dedicated network. Of course, there are still areas of progress but we shouldn’t forget what has already been achieved. Improving efforts is a permanent process. This unique capability must continue to adapt itself to the evolving threat as discussed above. Efforts in lowering the complexity burden of its force generation, integration and certification processes must continue. This should contribute to making it more and more reactive, integrated and interoperable, and thus more able to open to other non-NATO members within the framework of its partnership. In the unfortunate event of a crisis on the national territory, the military and civilian CBRN defence forces will likely have to work together: what are some challenges and learning opportunities in domestic civil-military cooperation and how have they been addressed to this date? The threat of WMD use on domestic soil is a permanent concern taken very seriously at the highest level, especially in France from the 2015 terrorist attacks. The civil-military cooperation is organized differently from a Nation to another. In France CBRN Defence capabilities have the same status than those among the armed forces. They are not first responders and are primarily dedicated to the support of the Armed forces. Their equipment adheres to military standards and is not developed to support population thus relying of their dual-use ability. However upon request from the civilian authorities approved at the national level, CBRN Defence military capabilities can deploy on the homeland territory in order to complement or supplement first responders when required. France has early identified the need to foster civil-military cooperation and ability to deploy together. From the 2008 Defence and Security White Paper, a CBRNe National Civil-Military Education and Training Center (CNCMFE NRBCe) was set up, relying on a network of non-permanent Zonal Training Centers in each of the seven territorial Defense Zones which have to conduct at least two interdepartmental trainings per year, each. The CNCMFE provides focused education courses; develops common procedures and coordinates specific trainings and national exercises. While this is a permanent effort, this ensures that mutual knowledge is developed and a minimum common approach is in place. If you could speak to all CBRNe industry leaders what would you ask from them to make your tasks, such as equipment renewal for example, easier? While technological progress is running faster and faster, it is key to maintain a continuous watch and invest in research and development. Innovative solutions should be sought in order to anticipate any technological break, such as in the area of biotechnologies or captors’ miniaturization. New generation command and information systems, and functional services will determine tactical as well as strategic superiority, dealing with the challenges of captors’ integration, real-time information, knowledge management and eventually decision making support. This will foster anticipation and thus reinforcing prevention activities as well as consequence management efficiency. French Armed forces are now on the way of a major CBRN Defence equipment renewal in the upcoming decade. We hope that upcoming industrial solutions will ensure the reach of a 21st century capability.